Building Systems – Abtech, Inc. Ranging from small booths, shelters or offices to larger schools, churches and medical facilities, there are a number of advantages to using modular style building over permanent building methods. All modular building methods are wholly prefabricated in a factory setting, and then completely or partially assembled into a building. The prefabricated pieces are then transported to the intended site location for installation by workers, often with the help of a crane or a forklift. As the buildings are not intended to be permanent features, some of them do not require a foundation to be attached to, although a level ground should at least be prepared to set the building on. The biggest advantage of using prefabricated buildings is in time savings. Buildings are constructed in a factory, thus minimizing the chances of delays due to weather conditions, subcontractor or labor delays and restrictions while waiting for building permits. Modular buildings are typically constructed by a standard, pre engineered design that does not need further approval or testing. The factory is able to run on a controlled timetable and produce constructed buildings ready for installation on already prepared sites. Another major advantage to modular building is that it is a lot more cost-effective than conventional building in terms of equipment, labor and time used from design to building operation. Standard modular buildings are considerably cheaper than their equivalent in traditional building materials, and are not likely to result in high maintenance costs at any point. As they are constructed in a factory, modular buildings are held to strict code and quality standards, ensuring a quality product. While some modular building systems are used as permanent facilities, they are more likely to be considered long term temporary features and often are not designed to last more than a decade or two. 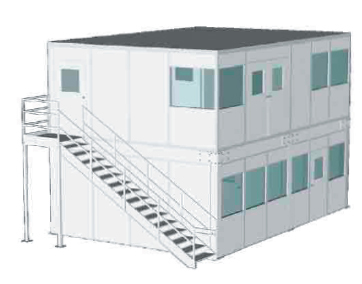 Components of a modular office or building typically include a base, a frame from a material such as steel, aluminum or lumber, wall panels, doors and ceilings. Electrical wiring, interior lighting, insulation, plumbing, HVAC systems and temperature control units are all able to be installed in modular building systems according to the intended use of the space. They are also able to be custom designed to an extent with regard to layout, colors, trim and interior design. Building Systems Modular building systems are prefabricated long term temporary or semi-permanent alternative construction solutions to permanent buildings. Industrial manufacturing facilities, warehouses, construction sites, banks, storage buildings, parking garages, security systems and more use modular building systems to provide extra space or shelter.